! Be in fellowship with WMEK today! Be part of a growing group of congregations and organizations who hold similar beliefs as the First Followers of the Messiah Yeshua: Messianic Jews. 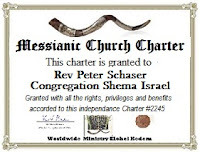 Get the Charter Documents of your new or existing Jewish Messianic congregation, organization, or ministry with Worldwide Ministry Elohei Kedem (known as WMEK). WMEK Messianic Association provides you with educational materials Videos; PowerPoint Siddur for weekday and Shabbat prayer services, and many more educational materials, legal and spiritual support and guidance in your walking to success in your congregation's or ministry's efforts. Also, to offer a valid charter, some countries and even states demand that a true physical church or ministry exists. 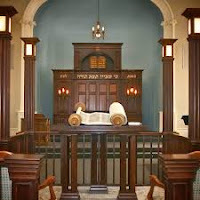 Worldwide Ministry Elohei Kedem complies with these standards having a working congregation within a private building to serve members at Kehila Elohei Kedem, a Jewish Messianic Fellowship congregation. Each fellowship, congregation or ministry will be issued a document of Chartered Affiliation with WMEK. 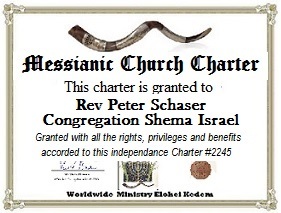 The cost to charter or fellowship your congregation with Worldwide Ministry Elohei Kedem is a one-time payment of only $45.00. This fee helps to cover our operating costs. WMKE Messianic Association does not govern the internal operations of any group or ministry, however, our office is ready to respond to any spiritual need of which we are called to help. You are never required to send any tithes, offerings or tzedakah to this ministry. (Please allow 1 week for Processing & Shipping ). 4. You must be Legally Ordained by us or by a recognized institution. -You should be at least 20 years old. -You should upload a real photo of yourself. -Send name of your Church, Group or Ministry. And the name of your fellowship, congregation or ministry will be aggregated permanently to our Directory of Messianic Congregations in English and Spanish in Answersintorah.com and Respuestasentorah.com, which are always in the top two pages of Google, Yahoo, and Bing. WMEK offers affiliates, resources such as Siddurs, PowerPoint Seders for all Leviticus' Feasts and Holidays of the Bible, Messianic Amidah books, How-to-Videos and many other helps to equip our congregations and members. Once your congregation or ministry is chartered with us, you will receive the keys to this valuable section of our website. More than 100 resources at your fingertips - everything you need to start or run a Ministry or Congregation. WMEK a Netzarim Association of Messianic Congregations. To "Charter Your Congregation with WMEK", please Pay Now and complete the below application. Remember the information provided on the Charter Application Form is for the exclusive use of WMEK and is completely confidential. None of your information will be released to anyone without your permission in writing.